Hey Y’all it’s that time of the week again. Yes it is Woman Crush Wednesday. Which means first off, one incredible chef is getting some love. Second, we all get a fabulous recipe! And third my dog is going to be sulking all day as I do my live tutorial on Snapchat (username blissbakery). Because I have a propensity to do a bit of bad singing and dancing and at the ripe old age of 11 she just can’t deal. However, she will get a teeny tiny little taster and that will temper her frustrations a bit. This week we have the awesome Paula Deen to adore. 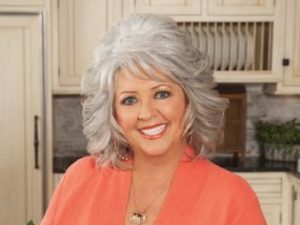 Yes she is the famous television chef, best selling cookbook author and owner of “The Lady and Sons” restaurant in Savannah, Georgia. I had the pleasure of eating there and I loved it. And it was the first time I ever tasted fried green tomatoes. It was a miracle I actually got in, as there was a line literally around the whole of the building. But once you taste the food you can see why. It is Southern food done right. Everything tastes so homemade and delicious. I was quite full when I left but really wanted to stay there camped out until the next meal just to keep eating. 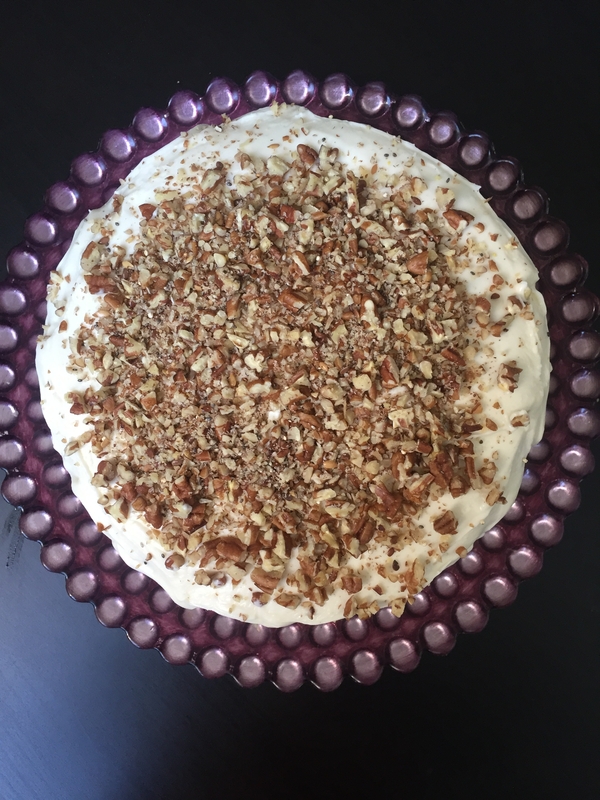 One of the most quintessential Southern treats is cake smothered in cream cheese frosting, so I thought how perfect to make one of Paula’s signature cakes. 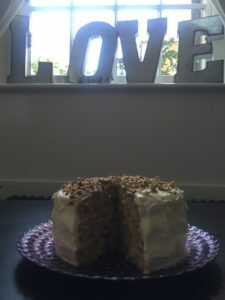 Hummingbird Cake is so light and the sweetness of the bananas with the pineapple is a perfect summer delight. Plus, pecans are definitely a Southern delicacy so anything with them would drive one nuts (pun intended). So let’s get to it! Pour the batter in the prepared pans. Bake for 26-28 minutes, until the tops sprinkle back. Cool in the pans for about 10 minutes then loosen from the pans and invert onto wire racks to cool completely. To make the icing, mix the sugar, cream cheese, butter, vanilla, and 1 Tbsp milk in a large mixing bowl with an electric mixer until the icing is smooth. 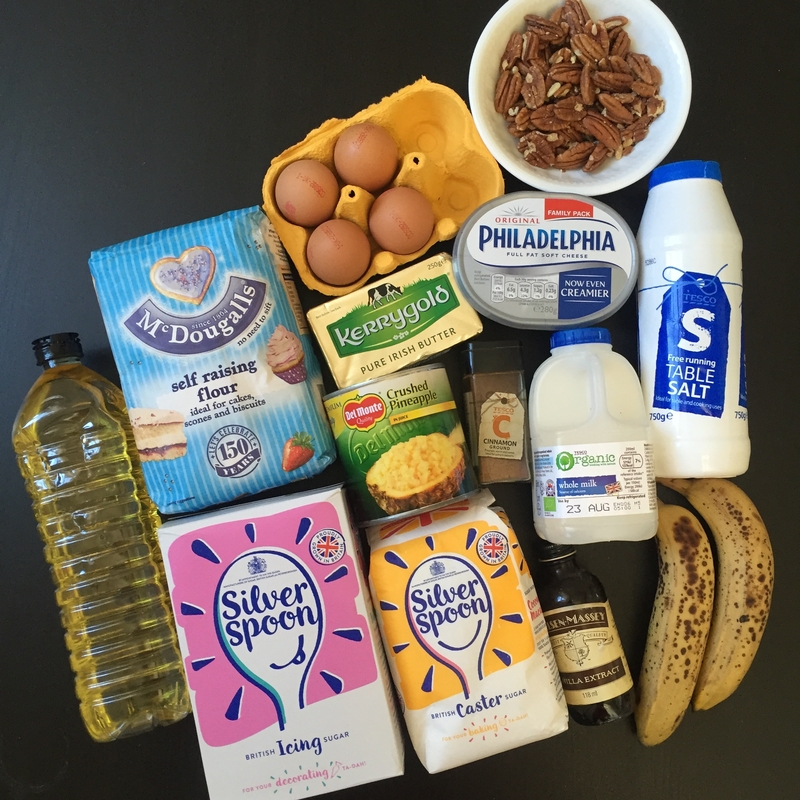 If needed, add more milk, 1 tsp at a time to achieve the proper spreading consistency. Ice between the cake layers, and on the side and top of the cake. Sprinkle the top with the pecans. Refrigerate until ready to use. Can I just say this may be the nicest cake I have ever tasted! 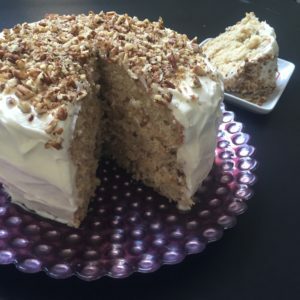 It was super easy to make and is beyond flavorful and moist! I was a bit concerned as the frosting was more runny than I am used to making myself. But once I popped it into the fridge it firmed up just in time for tasting! A great recipe and I am totally feeling like a Southern Belle ready to entertain guests out on the veranda! Only I made hot tea to go along with mine and likely I’d need an iced tea with the weather in Savannah this time of year. Besides her fab food Paula is well known for her comforting Southern accent and gorgeous smile. She has two sons Jamie and Bobby that have worked with her for years. After her divorce from their father she set up a catering company from home. She suffered from agoraphobia so she sent her young sons out to deliver the food at lunchtime in paper bags. As the business outgrew her kitchen and the boys grew up they opened The Lady and Sons in 1996. Other restaurants followed and as her popularity reached new heights from the Food Network show, including an Emmy award, they too got their own show. Paula is now happily married to her husband Michael and they live in Savannah. It is a gorgeous town, dripping with Spanish moss covered ancient trees, literary richness and a huge amount of Irish pride. Why they have the third largest St. Patrick’s Day parade in the world! My brother who was in the Army Rangers stationed at Hunter Air Base marched in that parade. Speaking of brothers, Paula’s brother Bubba also has a restaurant. 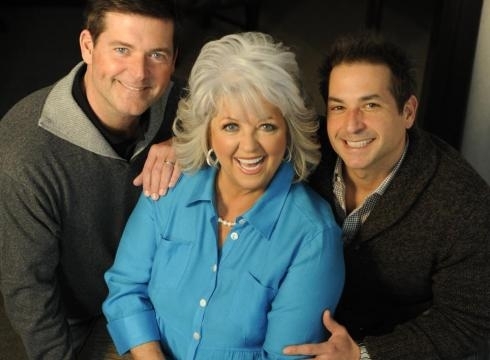 Food is just a family affair around Paula’s home! Thanks Paula for showing the world that you can overcome challenges, set backs and hardship and still be a Lady! You’ve shared your zest for life through your cooking shows and we have all benefitted. Sure Southern food is known for some things that are “naughty” but every now and again it is worth it cuz it tastes darn good! Now I’m gonna go back and finish my slice of Hummingbird Cake! I think I might have died and gone to cake heaven!